NucView® 488 Caspase-3 substrate is a novel cell membrane-permeable fluorogenic caspase substrate designed for detecting caspase-3 activity within live cells in real time. Visit our Product Video page to see a video of NucView® 488 in action. The rate of apoptosis typically varies from cell to cell even within the same population. As a result, various apoptotic events or markers accompanying the apoptotic process also occur differently among cells. Thus, it is important to be able to detect these apoptotic events on an individual cell basis. Traditionally, caspase activity has been detected either using a membrane-impermeable fluorogenic enzyme substrate such as DEVD-R110, or a fluorescently-labeled inhibitor such as a FLICA reagent. In the former case, cell lysis is required, thus precluding the detection of caspase activity in live cells. In addition, such caspase assays measure only the average caspase activity of a highly heterogeneous cell population at a given time. In the latter case, although a FLICA reagent can enter live cells to detect caspase activity, only the initial fluorescent signal following the application of the reagent can truly reflect the enzyme activity or the state of the apoptotic cells because any detected signal after the initial “snapshot” will need to consider the potential interference of the inhibitor to the enzyme and the apoptotic cell itself. Unlike conventional caspase assays, NucView® 488 Caspase-3 substrate detects caspase-3 activity within individual intact cells without inhibiting caspase-3 activity. 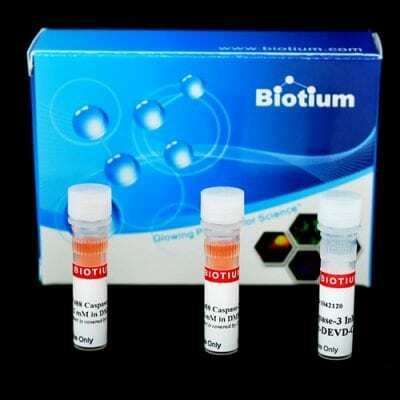 The substrate consists of a fluorogenic DNA dye and a DEVD substrate moiety specific for caspase-3. The substrate, which is both non-fluorescent and nonfunctional as a DNA dye, rapidly crosses cell membranes to enter the cytoplasm, where it is cleaved by caspase-3 to form a high-affinity DNA dye that stains the nucleus bright green. Thus, the NucView® 488 caspase-3 substrate is bi-functional, allowing detection of intracellular caspase-3 activity and visualization of changes in nuclear morphology during apoptosis. The fluorescent staining produced in response to caspase-3 activity is compatible with subsequent fixation and permeabilization for immunostaining. The kit contains NucView® 488 Caspase-3 substrate and a caspase-3 inhibitor Ac-DEVD-CHO sufficient for 100 flow cytometry or microplate assays (200 uL assay volume). The trial size kit contains sufficient reagents for 25 assays (200 uL assay volume). The number of fluorescence microscopy assays that can be performed with the kit may vary based on the size of culture vessel and staining volume used. The kit provides a convenient tool for profiling apoptotic cell population based on caspase-3 activity using either fluorescence microscopy or flow cytometry. Real time caspase-3 detection in intact cells: Detect caspase-3 activity within individual cells in a population. Bi-functional: Allows visualization of caspase-3 activity and apoptotic nuclear morphology at the same time. Simple & Fast: 15-minute homogenous assay with no wash required. Versatile: For detection by flow cytometry, fluorescence microscopy, or fluorescence microplate reader using fluorescein detection settings. Fixable: Compatible with standard fixation and permeabilization methods for subsequent immunofluorescence staining.